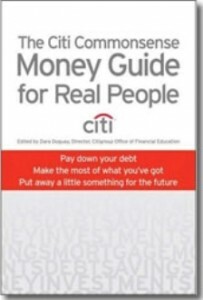 The Citi Office of Financial Education has written a personal finance and money management paperback book that covers a broad range of money topics that real people without a finance degree can understand. “The Citi Commonsense Money Guide for Real People“ by Dara Duguay and Bill Knight is not just for the customers of the financial giant. It is a guide written by the institution’s financial education entity covering a broad range of money topics for everyone in the hope that more people will become confident with their financial decisions and be able to take more control over their money. The book is broken down into three easy to read sections of approximately 70 pages each that cover getting your life back in order financially, learning the basics of money management, and then handling the curveballs life will inevitably throw at you. One interesting thing that this book does that a lot of other personal finance books do not is that it uses short vignettes or scenarios to stress the points that it makes in each section. These stories reinforce and help you understand the topics covered. Part 1 – Get Back On Track. The first section of the book covers getting your financial life back in order or starting it off on the right foot. This part covers topics such as making a financial plan, learning to save, getting out of debt, overspending, using credit properly, and covering the cost of a higher education. The book moves quickly covering a lot of ground. It does not go into great depth in certain areas, but it is a good starting point for many people learning about personal finance for the first time or those trying to get a handle on their money problems. The opening portion of the section which deals with making your own financial game plan was a great starting point for the book and definitely worth checking out. Part 2 – The Basics. The second section of the book talks about the basics of personal finance. It tries to provide the reader with a baseline of financial knowledge that we all need to know. The section covers topics such as budgeting, sharing your life financially with a spouse or other family member, educating your children about money matters, applying for a home loan, properly insuring yourself and your property, and investing. As you can see by the laundry list of topics, this book tries to hit almost all of the most important personal finance topics. A couple of the great topics and stories that I loved in this section were dealing with combining your finances with your spouse after marriage. There was also a great part in the book dealing with financial infidelity and how to recover from a spouse who has cheated on you with money such as by fibbing about how much a purchases cost, hiding debts, etc. There were also some great ideas in this section on how to handle giving your children allowances that I found incredibly interesting. Part 3 – Curveballs. The third, and final, section of the book talks about the curveballs of life that seem to always be thrown at you. This section covers how to save for a rainy day when you don’t think you can, busting your budget with the holidays and other events, identity theft, divorce, a second marriage, death of a spouse, and inheriting money. As you can see, this section covers a broad range of topics as well. The authors have tried to hit the largest financial pitfalls that most people face and struggle with. This section gives some tips and advice on how to stay flexible, adjust your budget, or help plan for some of these contingencies. Who Should Read This Book? This book is a great starting point for a lot of people. Beginning investors and young adults who are just entering the workforce will get a lot of great ideas and starting points to reference in “The Citi Commonsense Money Guide for Real People “. Like the title suggests, this book is for real people. You should definitely check this book out if you are living paycheck to paycheck or if you constantly find yourself having money problems month in and month out. Even though I say that this book is more of a beginners guide to personal finance, there were parts, tips, and lessons that even I came away with having learned. I admit freely that I am not educated on giving a child an allowance. It just is not something that my wife and I have had to deal with yet. This book gave me some great ideas in that respect. So, even an astute money manager or financial junkie can learn a thing or two from this simple personal finance book. Citi’s Office of Financial Education is celebrating its four year anniversary. The program was created as part of the company’s 10-year, $200 million global commitment to Financial Education. During Citi’s almost 200-year existence, Citi and the Citi Foundation have helped individuals and families to better understand how to use the financial resources available to them to meet their financial goals and dreams. The company believes that knowledge and financial literacy are critical in today’s complex world, and this book is one of the many ways that the company is trying to educate the public. The book is available in US and Canadian versions. Disclaimer: A review copy of this book was provided to Own The Dollar for this posting.